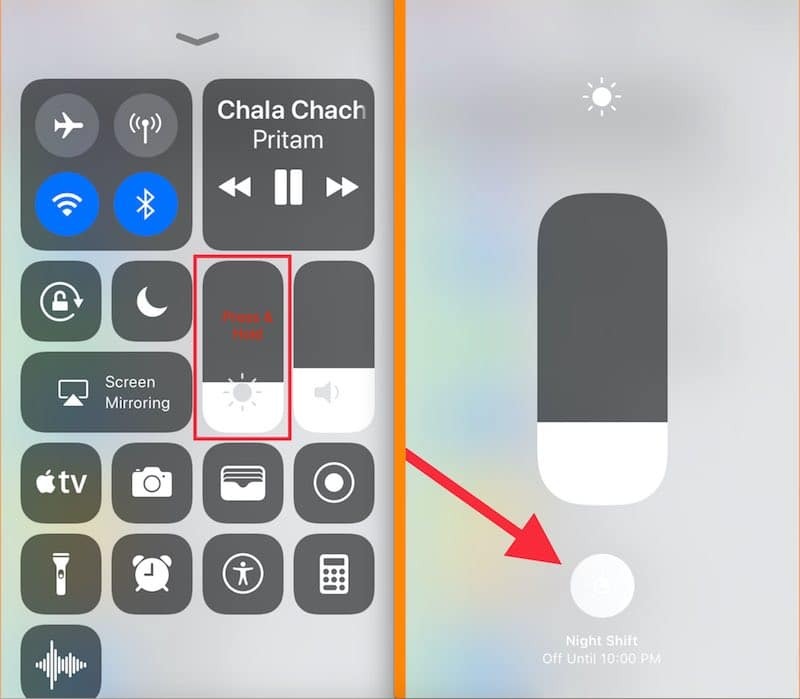 Shortcut to turn on/ turn off Night shift mode missing in control center in iOS 12. Back to the side apple developer gives new significant updates after notification center widget. Now we can use a customized control center and make necessary updates by add new settings shortcuts or remove unused. The developer was also planning to give essential control of the third-party app settings directly from the notification center. In the first glance, you might think that iOS Night Shift toggle is missing in Control Center, But it’s not aspected due to redesign. So get Night Shift sunset to sunrise access using below guide in iOS 12. Recently I found the biggest change in Night Shift mode control in the control center. That’s where I am discussing for the latest iOS running on iPhone, iPad. Other functionalities are the same as like access control center on the lock screen or home screen. Swipe up the finger to up on iPhone screen, See the vertical bar mark with brightness icon. Tap on long hold on it. Now, vertical capsule bar in vertical and just below the bar see Brightness icon. Here you can find the name “Night Shift” and Current Status (Time for auto disable or enable). Tap on Round brightness icon. Just single tap you can enable Night shift mode, and again repetitive tap will disable night shift mode. More settings on Customize Night shift mode, find under the settings. Go to the Settings app > Display & Brightness > Night Shift. Add more controls and shortcuts in the control center. See add new controls in the control center. Wants to test or try new control center on your iPhone, iPad. A more helpful guide and tutorial, stay connected with us on the social page (Facebook, Twitter or Google+) or subscribe us.